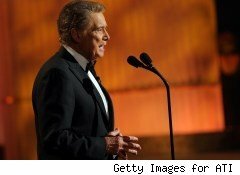 Regis Philbin, America's favorite crotchety uncle, is retiring from his televised talk show later this year, ending a remarkable decades-long run in America's living rooms. Philbin, 79, announced his departure -- where else -- on ABC's Live With Regis and Kelly. The Internet gasped in disbelief, judging from the reaction on Twitter. He's one of the last reminders of a kinder, gentler American pop culture. He seemed to know everybody in show business, and everybody knew him. Unlike his fellow talk-show war horse Larry King, whose run on CNN ended last month after 25 years, people seemed to like Philbin even when they mocked him. Viewers sensed he was genuine, no mean feat in TV. He kept a schedule of TV and commercial appearances that would have exhausted a far younger man. In recent years, Philbin has had health problems, including heart bypass surgery and a hip replacement. For years, there were tabloid reports that co-host Kelly Ripa was trying to push Philbin out the door. There were probably an equal number of ludicrous reports that Philbin wanted to replace Ripa. Even if these rumors were true, the producers seemed unwilling to mess with the show's chemistry. Together, the two hosts were a hit, which is why finding a new partner for Ripa may be difficult even though there are several possibilities -- including her husband Mark Consuelos and CNN's Anderson Cooper. How the show will fare without Regis remains to be seen. Philbin first entered the American subconscious in 1961 as the sidekick of Rat Pack comedian Joey Bishop on the Joey Bishop Show. Bishop's teasing of Philbin got so bad that he walked off the show and didn't return for several days, according to IMDb. Three years later, he hosted That Regis Philbin Show in 1964 in San Diego, then switched to A.M. Los Angeles six years later. Philbin relocated to New York, teamed with Kathie Lee Gifford in 1988 and Kelly Ripa in 2001, creating daytime TV history. He hosted Who Wants To Be a Millionaire, was a panelist on America's Got Talent, appeared in a few movies, crooned a few tunes and won several Emmys. "There is a time that everything must come to an end for certain people on camera, especially certain old people," Philbin told his fans this morning. He has earned his right to kick up his feet and relax. His producers may not be able to do the same.